Characterful, classy build, evocative old-school sound and excellent street pricing. This one's spoken for! Classic feel and tones. Great value for money compared to Gibson/Epiphone. Period looks. Guild recently expanded its Korean-made Newark St Collection with this centre-blocked Starfire V, which adds a Bigbsy to the existing non-vibrato Starfire IV. The 1958 'Slim Jim' T-100 was the first Guild thinline hollowbody - available in single- and double-pickup versions - and laid the foundation for the 1960 Starfire I (single-pickup), II (double-pickup) and III (double-pickup with Bigsby vibrato). The double-cut, centre-blocked Starfire IV joined the line in 1963 just before the V, which added a Bigsby and a master volume control, with a more deluxe VI version appearing the following year. "Placed side-by-side with a Gibson ES-335, the Starfire V somehow looks more 'retro', more 60s"
Firmly intended to compete with Gibson's ES-335, the Starfire IV, V and VI nonetheless retained plenty of Guild style, not least the more spacious cutaways and the wooden foot tune-o-matic-style bridge. Placed side-by-side with an equally new Bigsby-equipped Gibson ES-335, the Starfire V somehow looks more 'retro', more 60s. 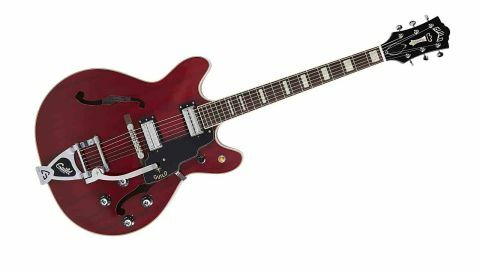 The body here is made from mahogany laminates with a distinct striped figure under the Cherry Red finish, which was introduced with the first Starfire. Then, as now, it all creates a different aesthetic to the Gibson ES-335. A major difference is the control set-up, which here augments the Gibson layout with a smaller knobbed master volume control on the treble horn, just behind the three-way toggle pickup selector. The pickups here replicate the early-60s introduced 'Anti Hum Pickups' and are period correct, along with the black plastic, chrome-tipped control knobs. "The guitar feels classic; it is set up to a high standard, and plays superbly"
The guitar feels classic; it is set up to a high standard, and plays superbly. The Starfire's neck joins the body at the 18th fret - a change that occurred in 1967 from the previous 16-fret join - and the 'soft U' profile, (21mm deep at the 1st fret, 23mm at the 12th) feels slightly flat-backed with a bigger shoulder than a more modern oval C.
The guitar has a nicely-cut bone nut, finely fitted and polished medium-gauge frets that sit over the edge binding, slightly green-y 'aged' pearloid block markers and a radius that is closer to PRS than the flatter Gibson standard. Again, like the cosmetic appearance, it gives this Guild its own specific feel. It's a fairly weighty guitar for a semi, thanks to the full-length maple centre-block, and has a classic strapped-on feel. It is, of course, thinline depth and feels every bit an ES-335. It has a 'clean' sound, with low-end definition, slightly bright on the treble pickup with decent sustain and, importantly, a very respectable feedback threshold. It likes volume, and while similarly evocative of virtually all those classic styles, it's the stage version and effortlessly takes you on to early The Who, The Jam or Britpop voices, while seemingly equally at home with rootsy, strummier Americana. There really is an old-school connection. The toggle switch placement and that master volume make a lot of sense, especially if you use the Bigsby a lot. Both guitars are hard to put down. There really is no shortage of semis to choose from, but Guild's heritage is quite a draw: the lesser- known 'new' boys to Gibson and even Epiphone's more stately pasts give a real feel of 60s modernism and the first golden age of the electric guitar. With fine attention to the brand's past, this is not a slavish reissue, but it certainly captures a specific feel and vibe of the original guitar.